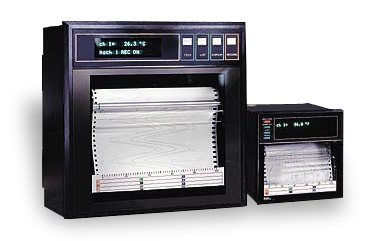 The 100 mm light weight and durable Fuji Electric PHE strip chart recorder offers the latest in low-cost inkjet recording instruments. Available in 1, 2 & 6 channel configurations, the PHE can record continuous analog trending on the same axis which eliminates the phase shift syndrome exhibited by conventional pen recorders. It also has the ability to digitally print periodic data, scale line, alarm condition, burnout and other parameters. Featuring an affordable inkjet print mechanism, the PHE strip chart recorder prints crisp, no-smudge characters without physically contacting the paper. This print-head spray's the ink in tiny dots to create a trace in vivid colors for one, two or six channel continuous recording. Utilizing a piezoelectric element, the PHE strip chart recorder creates stunning reports and print quality for the same price as a pen recorder. Lesser number of moving parts ensures years of trouble-free operation. One of the most powerful features of the PHE strip chart recorder is their ability to create a full complement of status reports – scheduled or on demand. You may specify daily and summation reports for any period of time from 1 to 24 hours. These reports are printed in crisp digital type and provide you with important information such as: Periodic Data for each Channel, Totalized Values for each Channel, Maximum & Minimum Recorded Value for each Channel and Time of Occurrence, Average Value for each Channel.